Not only was she trying to steal Yoshi's sword but also she is accused for stealing for herself. 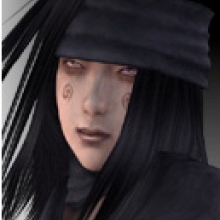 Well, hmm... if there was a female Manji ninja in Tekken, I would gladly welcome her. Maybe Yoshi's daughter? ^^ It would be so awesome! 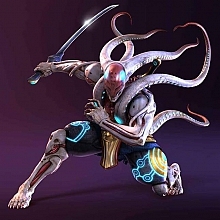 Now as Yoshimitsu's sword loses power and he himself adapts to changes by extending his abilities, a Kuni-like character might be very welcomed. I liked Soul Calibur for that reason...you could make Yoshi a girl if you wanted. It's cool to have that kind of creative control with your favorite characters' moveset. Saikoro : Coming late to this topic, I think its hilarious to know that Kuni just was a copy and paste of Yoshimitsu back in the original Tekken. Namco must have realized that this looked horribly gay and decided to make a female counterpart to add to the whole storyline. I mean, Yoshimitsu in a Purple BodySuit?!?! I miss her a bunch, she was my second main in Tekken tag. That would definitely be an excellent idea and much like Tekken tag, it would be awesome to see some sort of tag add-on or separate game like that. Kunimitsu is a character in my opinion with a lot of potential, she didn't have to be completely different from Yoshi, considering she trained in his style of Ninjutsu. Yes it would be nice to see her with some new moves of her own, based on that particular style of the weapon she specialized with, but she doesn't have to be completely different. Nina and Anna, no matter how different they may be now especially in Tekken 6, still carry some moves that have the same motions that look and work the same way. Why not that for Kunimitsu and Yoshimitsu. She's got plenty of potential in my opinion, I don't think Namco should have ignored her like that and put her aside from the roster. I dont Really remember much about Kunimitsu...But I remember that I picked her every time with Angel in the bowling mini game in Tekken tag tournament. I must admit,that wasnt a very good combo with my skills back then. I played as her a bit in arcade history when I bought Tekken 5...But I just felt that she wasnt as effective as Yoshi. Namco seems to forget that a good love story is better than none. That's why Tekken 2 had an unique atmosphere. Because of Kazuya and Jun relationship and mysteries around Yoshimitsu and Kunimitsu. But on a serious note, I can't even express how much I love the idea of those two having a love/hate relationship. It's so appealing! It's much, MUCH more interesting than a typical relationship. I've always had it in my head that they were both in the Manji Clan, maybe they had something going on back in the day or at least had feelings that started to develop, and then over time I think Kunimitsu grew to be proud and arrogant and greedy. Then things went south and Yoshimitsu, deciding to extinguish any feelings he might have had for her, banished her for the good of the clan. It's such a great story. It leaves so much room for further development and conflict. ... and this what could be a great story, got replaced with Lars and Alisa... which is a bit too straight if you ask me. Lars and Alisa, as adorable as it may be, is a little bland, yes. Aozame32 : Lars and Alisa, as adorable as it may be, is a little bland, yes. How can you mention "Lars and Alisa" and "adorable" within the same sentence!? That duo is doing my head in, big time... I'm planning on a "Chainsaw Buffet", Lordi style, with them two. Imagine a similar campaign mode with Yoshimitsu and Kunimitsu. Don't hype, just imagine it. In the end, do you reckon you'd want to know the real deal between them two, if it's completely the opposite of what you've thought of it? Some things might be better left uncovered. Such campaigns might lift the veil of mystery around Yoshimitsu too much. TouchĂ©. I'd have to agree with the idea that uncovering every little secret about Yoshimitsu and Kunimitsu would definitely do them a disservice. However, I think we can all agree that some sort of chance for the two to be in the spotlight, if only a little, would not only be entertaining... but totally awesome.